Umm, it is really Week 4? Did I close my eyes and 7 whole days just flew by?! 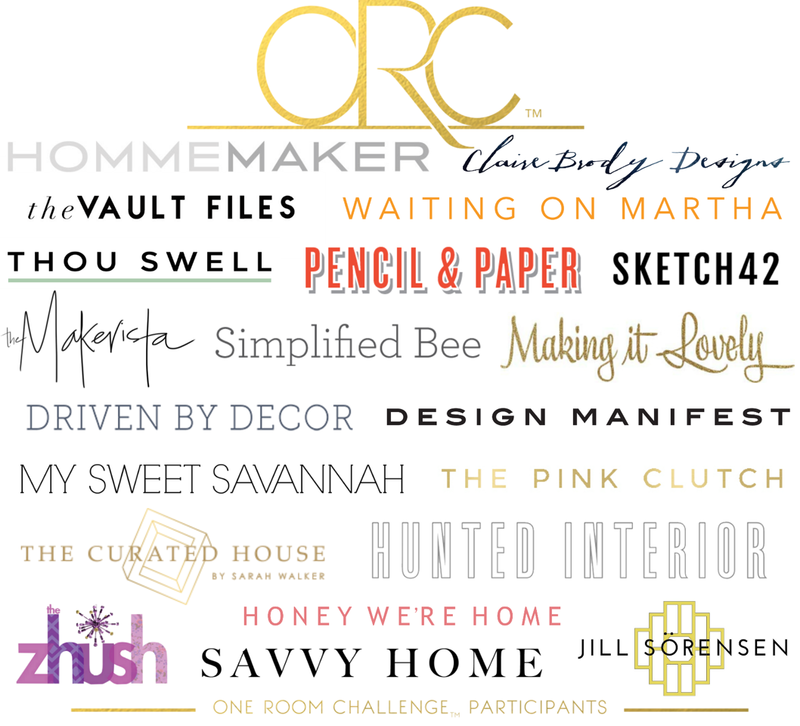 Week 4 it is and it is officially two weeks until the reveal for the One Room Challenge. For me this is the week that things start going wrong. You know what they say about the best laid plans! If you happen to just pop onto the blog today I am four weeks into a six week challenge to transform our den. She started out as a 1982 Georgian dark paneled room and will end up as a 2016 lacquered white stunner. Well ... that is the plan anyway!! This week is all about lighting and drapery. Oh, and more fabric. Can you really have too much fabric? I am so excited about the details coming together. The details are truly my favorite part!! Since the room is on the main floor with no attic access I can't add a chandelier. At first I thought I would be really upset, but the more I thought about it the more I realized it was perfectly ok. In fact, it was fabulous. I am a big believer in lamps, even going so far as to have a stash of them in the basement for restyling. 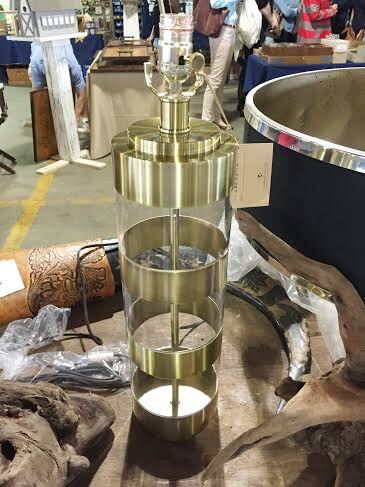 This was my opportunity to showcase 4 lamps, maybe more! Of course, I didn't chose to use any of the lamps I already owned, that would be too easy. Instead I played "move the lamp" and adjusted a bunch of the ones I was using to give the house a fresh look. And then I hunted down lamps for the den. When I shopped the Metrolina last month I found two of these babies for $60 total. I had to contain my excitement when she quoted me the price. I quickly stuffed those babies into by bag and hightailed it out of there. I have three more lamps on my radar along with scones for the office wall and then, of course, they will need custom shades. I do love a custom shade. It is another way for me to add in pattern. More pattern = more fabric. Win, win!!! I am beyond excited about my drapery for the den! We have a large bay window and it is just begging for some incredible long drapes. You can just begin to see it really well in the photo above. We have a matching mirror in the kitchen and they are truly amazing for light. To the left of the window lies a door which heads out to our deck. Both of these spaces need drapery and I am thrilled with the choices I made. I sent the drawing above to the amazing ladies at Drawn Co. who will be making all three treatments. 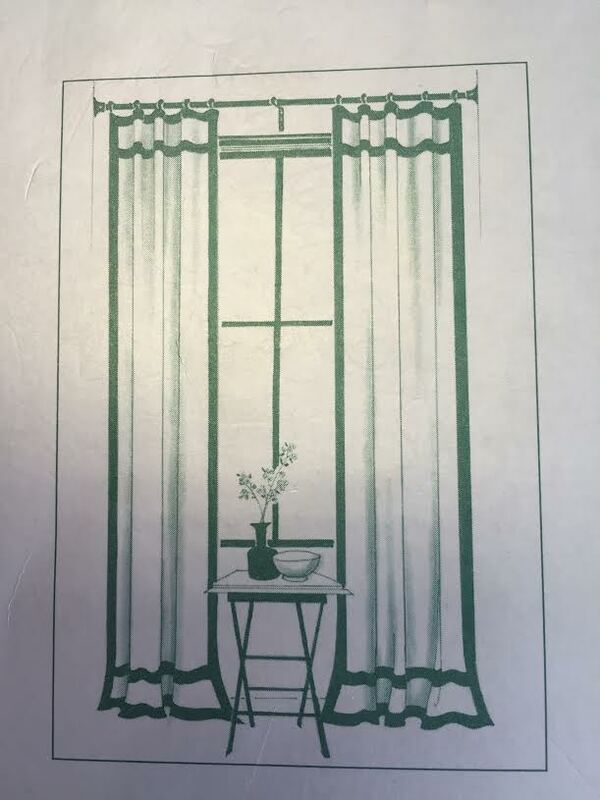 The bay window will be getting long panels just like the sketch above and the door will be getting a major makeover with a roman shade. 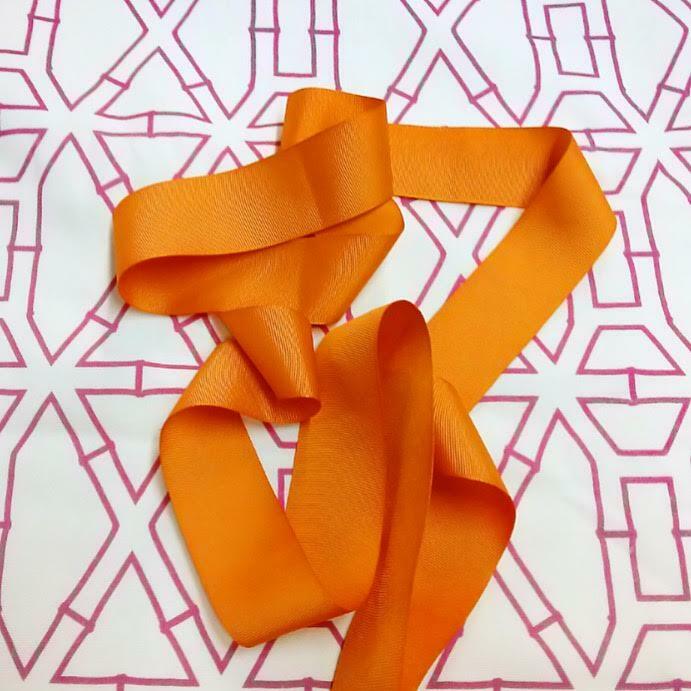 The incredible bamboo fabric is a custom color choice from the amazing design of Clairebella. I chose a Clairebella fabric for the breakfast room windows and the result was incredible. I am thrilled with the fabric she custom colored for me. I asked and she delivered, and in a big happy hot pink way! The addition of the orange trim truly makes it perfect for my room. Both of these companies have been incredible to work with and the decisions and conversations have been seamless. (See what I did there?) I will be using both Drawn and Clairebella again and again! Oh, and the rods? After loving the lucite rods I chose for the breakfast room I am most definitely a repeat customer. Another set of these babies from LuxHoldUps is on the way to me!! #eek ... Can you tell I am excited? I am a girl who likes to mix colors and patterns. That means a whole lot of paint and fabric choices!! I am so incredibly thankful for my House Plus Love binder. It has kept me organized and even reminded me of a few details I need to be thinking about. Thank you sweet Brittany for the amazing gift of this binder. If you are a designer, you need one. Buy now, thank me later!! 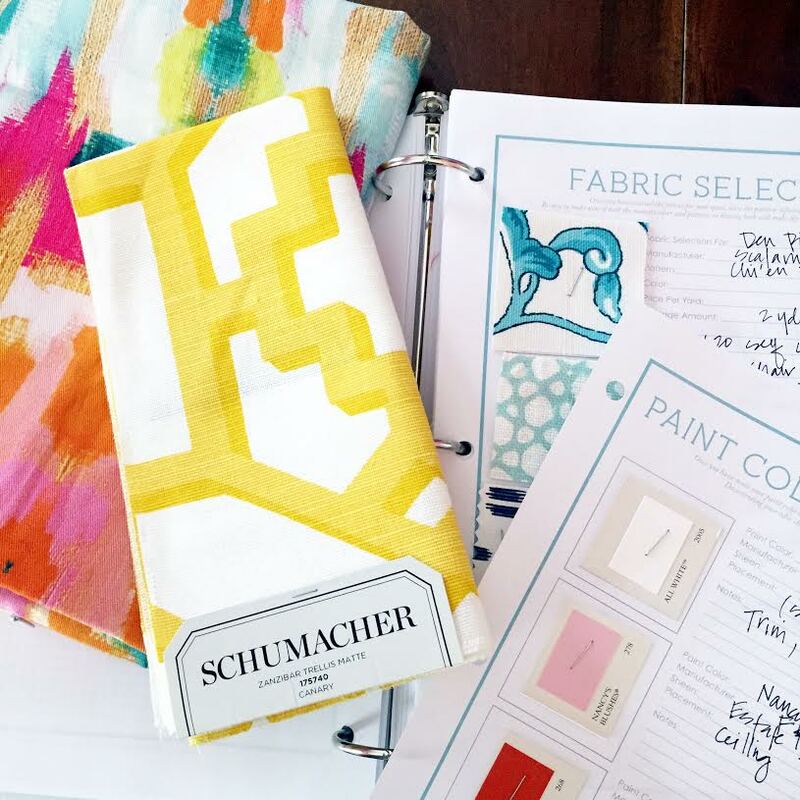 When I began to chose fabric for the room I immediately went to DecoratorsBest. I absolutely love this company. The customer service line is so helpful in helping me locate what I want. 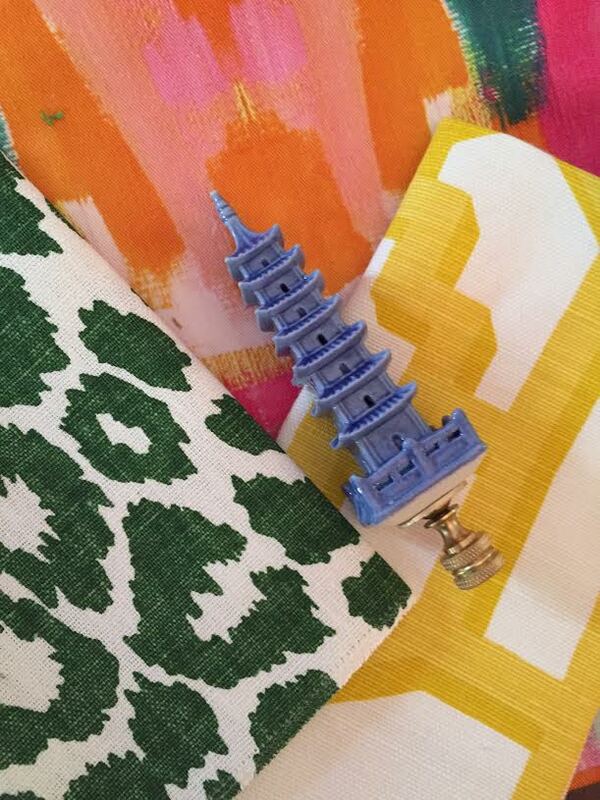 Since I had the Blush Label Bombay fabric as my jumping off point, I knew I wanted to incorporate tons of color. Lots of yellow, turquoise, hot pink and orange. And then there is the green from the sofa. Oh, and blue ... every room needs to be grounded with blue. Basically I needed a rainbow of colors and pattern. With DecoratorsBest I achieved just that. And every single time I needed to add more, I ordered it and a few days later it would show up. I needed more samples? No problem, here they came. I finally settled on the choices you see in both photos. 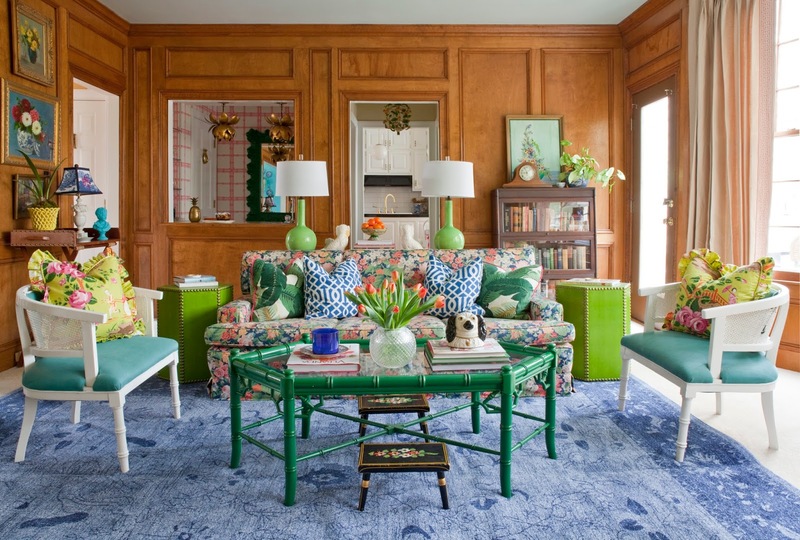 The yellow is Schumacher Zanzibar Trellis Chintz in Canary, the turquoise is Scalamandre Chi'en Dragon Linen in turquoise and the green is Schumacher Iconic Leopard in green. I love the mix and the fabrics themselves are di-vine!!! Oh, and when I changed my mind at the 11th hour for wallpaper they were so good to make the change and send me the new pattern. No questions asked and nothing but "of course, its on the way". Amazing products and incredible customer service! #yesplease!! And that incredible finial. I can't wait to get them on my vintage lamps. I love every single pagoda finial R Titus Designs makes. These blue ones allowed me to keep adding the blue elements I needed to feel grounded in the room. I am busy making plans for a few of these fabrics. Don't you love every single one of these? I see floor pillows and shades. Yes ... SHADES!!! Wallpaper bookcases - wallpaper here, just waiting for paint to finish! New couch in amazing green velvet - at the upholstery spa! Add a second set of chairs ... a pair of Hers chairs - Done!! Skirted small console for door area - Scratch this idea!! Panels for bay window - on the way! Window treatment for door to deck - on the way! Round coffee table - Done!! Area rug (relocate this blue one) - Done! Art for mantle - Done! Lamps x 4, maybe 6 - in progress! Pillows for the sofa and side chairs - Done!! I am afraid to say it ... but I think I am on target!!! Let's keep that momentum rolling!! You can also follow along with our journey on Instagram using the hashtag #oneroomchallenge. And, make sure you are following House Beautiful magazine on Instagram and Pinterest. They will be showcasing bits and pieces along the way along with live pinning! This will be an incredible round, and I will be sharing tons of sneaks and pictures during the weeks as the room comes together. The good, the bad and, yes, the ugly. Yep, it will all be there for you to see. This girl room is getting a massive makeover. Think major plastic surgery with a whole new wardrobe. You can read about week 1 on the House Beautiful home page here. I am still so excited reading their thoughts from our first week. It's so good!!! Paige, I am loving this plan and can not wait to see the finished design! I just noticed your Paint and fabric organization sheets! They are perfect! Where did you find them or did you make them yourself? Oh my each week keeps getting better and better!! I can not wait to see the paint and dear gosh those fabrics!! Sounding awesome so far! Wow, just wow. I love all the colors and patterns. Can't wait to see the finished product. It is all so im=incredible. 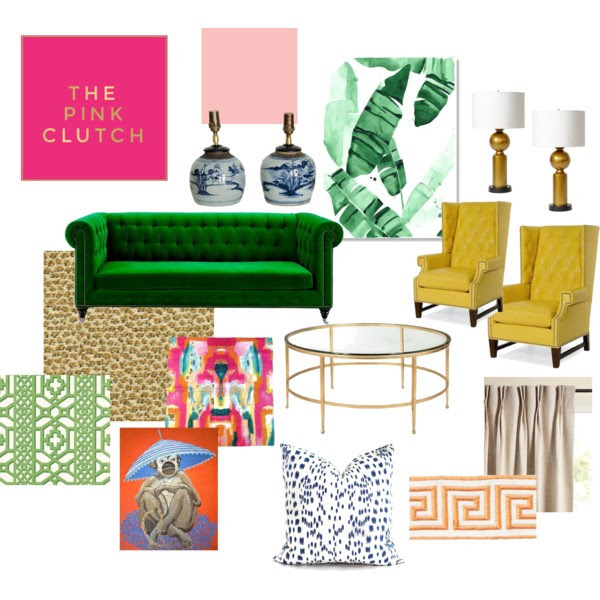 I feel like I am dreaming about the perfect chinoiserie chic home. Love it. You are the fabric whisperer. This is so exciting, Paige! 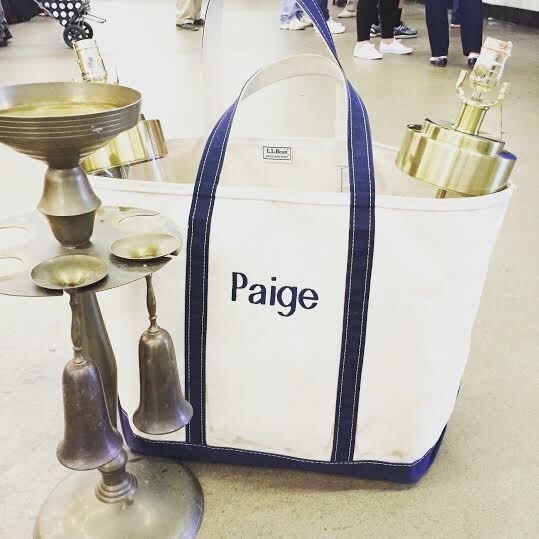 I LOVE it all Paige!! Holy Moly! It is going to be beautiful!! Can't wait to see! And thank you thank you for sharing the binder!! AHHH!! Big hugs! You are so fearless with color. I love it! I love the idea! You are such an inspiration! Thank you! On the way is right, just shipped out today!! We can't wait for you to get these beauties in your hands...definitely makes for a TGIF! Those colors are amazing!! Can't wait to see more of this design! 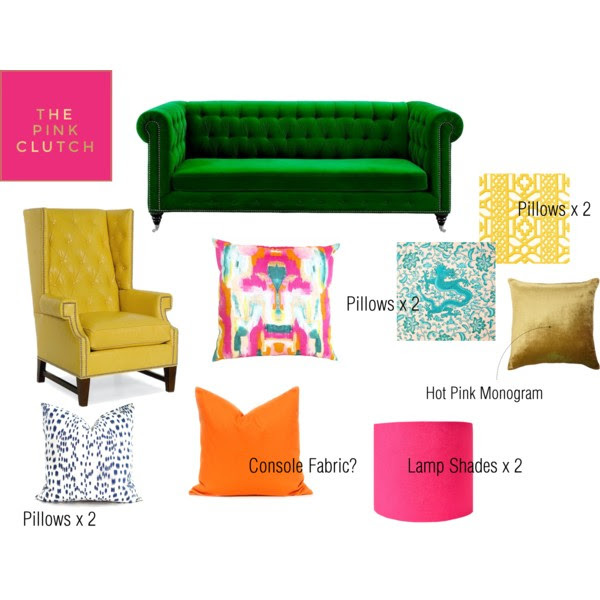 It's going to be such a fun room with all those bright colors! Lots to do, but looks like you're right on track! The next 2 weeks are gonna fly by! Can't wait to see this beautiful reveal Paige! 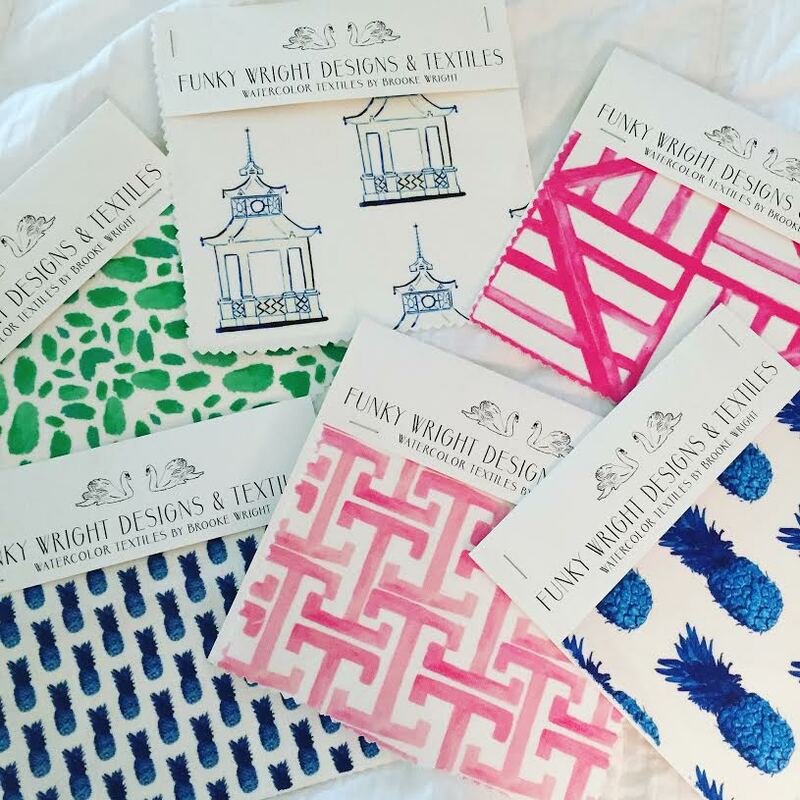 Paige, your colorful fabrics are so gorgeous! I can't wait to see all these elements you have planned come together!! It's going to be fabulous! I was just all around the internet looking for good paper writing companies for my dissertation when i followed through your link and boy i was not disappointed. You've got amazing posts around here that i forgot about my priorities for while.